For many years, pastoralists in Northern Kenya have been affected by Opuntia stricta, an invasive cactus native to the Caribbean region and commonly referred to as prickly pear. This invasive species not only has overtaken the landscape and shrunken the forage space for both wildlife and livestock, but it also produces purple-reddish fruits that are highly toxic to animals. While there are many tales about how and when this invasive cactus was introduced in Kenya, it was most likely brought in by ranchers in the 1950s as a live fence to demarcate land boundaries. 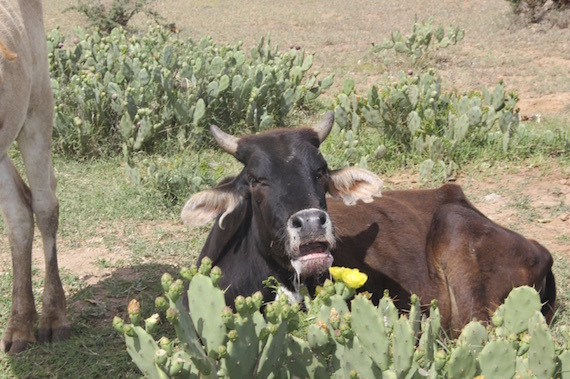 Mr. Sepeika, a livestock farmer in Laikipia, Kenya, says the plant has invaded large tracts of his grazing land and even thrives during dry spells. He adds that domestic and wild animals suffer either sickness or death as none are spared by the wild fruit. “The cactus has small spines on the surface of its fruits that can lodge in the throat, stomach or intestines of any animal that eats it, oftentimes causing a slow death.” For Sepeika and his fellow pastoralists, livestock is everything because it provides food, income, as well as status. Thus, the invasive prickly pear threatens the livelihoods and way of life for pastoralists in the region. As with many invasive plant species, large-scale eradication of prickly pear is expensive and time-consuming. It requires a combination of herbicides, manual cutting, burning, and even the introduction of a specific sap-sucking bug that heavily infests the prickly pear leaves, gradually destroying the plant until it finally dies. Peter Hetz of the Laikipia Wildlife Forum has firsthand knowledge of the difficulties in battling this nuisance over the years. “We have even tried removing the plant manually by clearing the bushes, but have combated these invasive cacti without much success.” Adding to this challenge is the lack of accurate mapping of the areas with the highest concentrations of this plant, which is necessary to effectively mobilize limited resources in eradication plans. Seeking to address these shortcomings, SERVIR - Eastern and Southern Africa at the Regional Centre for Mapping of Resources for Development (RCMRD) developed the Invasive Species Mapper – a smartphone application that facilitates the collection of data on the current distribution of prickly pear and other invasive species in Kenya. Using satellite data and geospatial technologies, this app was designed to accurately map invasive species hotspots where particular plants are concentrated, which is important in prioritizing and planning both financial and human resources to eradicate invasive plant species. This app can be downloaded onto any Android phone and is customized with a comprehensive list of local invasive plants to aid in identification. 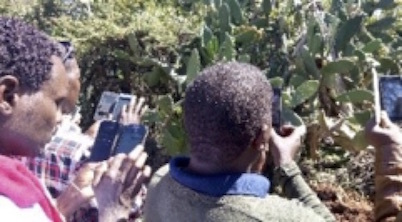 Livestock farmers and local community leaders can now easily mark the precise location prickly pear clusters by taking a photo with their smartphone, which is uploaded with GPS coordinates and transmitted directly to RCMRD’s database for processing. This app can also work offline when there is limited internet connectivity. Once data collected in the field are sent to RCMRD for analysis, a predictive model is applied to produce maps of current and future distributions of the invasive species under different climate scenarios. SERVIR has offered multiple training workshops to build the capacities of various RCMRD partners in using the application to collect data. John Letai, Deputy Director, Environment and Natural Resources of the Laikipia County Government, welcomed the new mapping tool saying the county had estimated they require $2 million (USD) to eradicate prickly pear in Laikipia alone. He added the plant spreads remarkably fast, especially when baboons and elephants move across the landscape. Written by Dorah Nesoba of SERVIR-E&SA/RCMRD.